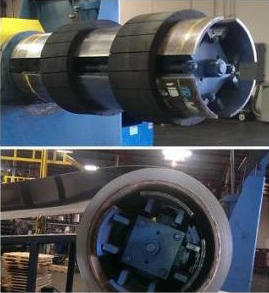 With Wuxi’s coil mandrel expanding rings, you can increase efficiency and safety while eliminating waste. This is a product that will prove its worth after using it only a few times. Furthermore, it will generate substantial returns for your company in the long term. The super expanders can be used individually or in pairs to fit over your coil handling mandrel, increasing its OD. This eliminates the issues with odd sized coil diameters with a rubber that expands with the mandrel jaws. They also prevent coil damage and slippage, so it is not unusual for companies to use them as a permanent accessory. Wuxi Aomeite prides itself in the ability to custom-manufacture our products to fit each customer’s needs. Allows for handling coils with any ID.